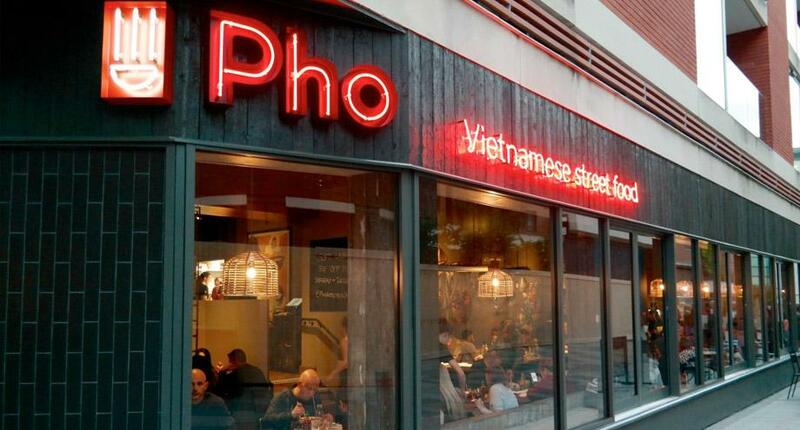 There's a new restaurant in Leicester that you most definitely need to pop on your list of places to dine, Pho is a family-run business that serves great value, authentically prepared Vietnamese street food with restaurants across the UK, it's latest just on the tail end of the Highcross Shopping Centre. The name Pho comes from the Vietnam national dish, Pho, an aromatic and nutritious rice noodle soup served with a side of fresh herbs. What's also so good about this restaurant is that they have lots of options available for vegans and with their menu being mostly gluten-free (it was accredited by Coeliac UK) it caters for so many diners. The place seems already pretty popular and has already attracted a lot of customers through its doors, we attended quite late after their opening and it was buzzing with people and the aromas of great food. 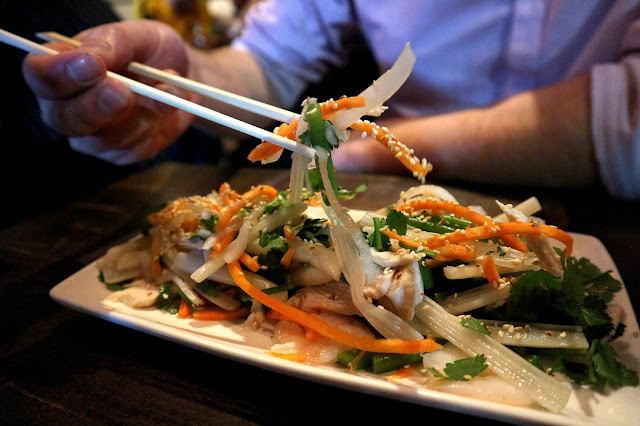 I've never tried Vietnamese food before but what I really enjoyed about my visit to the restaurant was that the staff ensured to explain the different dishes on offer and their individual flavours to make our decision easier to make. Even as the food arrived they would articulate how we could use the dips available to get more flavour from our dish, making it for a great venue to die in. All of the food on offer is made fresh in-house on a daily basis. All of the dishes come with their own sauces, but if you fancy it there are also table condiments available if they are more to your taste buds. These include homemade chilli paste, garlic vinegar, siracha, fish sauce of hoi sin. For our starters, I decided to take a friends recommendation (and because as soon as they were mentioned I couldn't stop thinking about them) and chose the Nem Nuong. 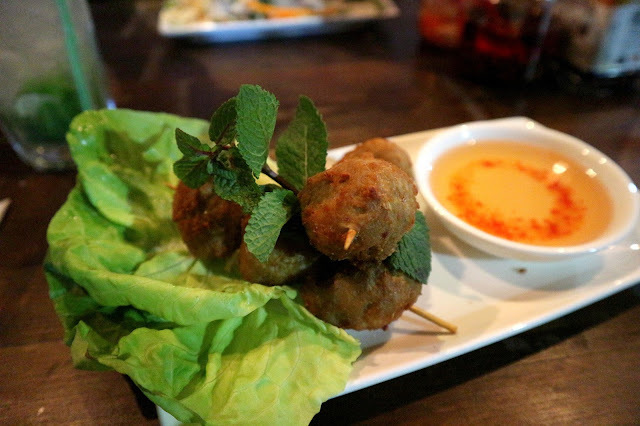 The homemade pork and lemongrass meatballs come with lettuce and herbs to wrap and dip into the nuoc cham dipping sauce. The sauce was kind of like a sweet and sour and went so well with the flavours of the meatballs and lettuce. You definitely need to get stuck into this starter, I wasn't sure what to expect from wrapping the meatballs up in a lettuce leaf but the natural, meaty flavours were really pleasant. I could have happily tucked into another portion of this. 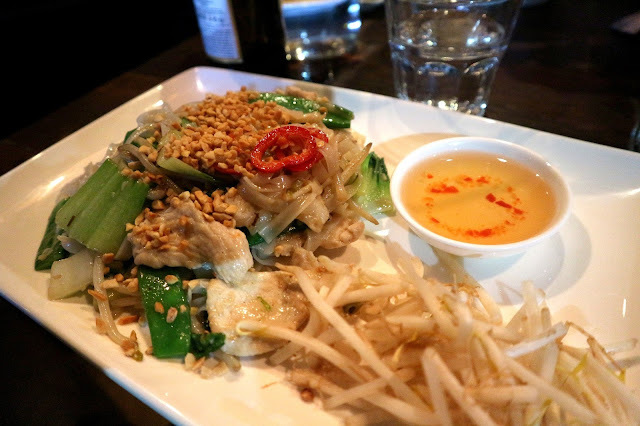 Jordan sampled their Goi ngo sen, a tangy dish of lotus stems with green bean and sesame seeds. He added Chicken and Prawn to the starter too. The flavours were really delicious, even if it was slightly tangier then he had expected it to be, however all in all very tasty. For the main course, Jordan decided to take a try at one of their authentic Pho dishes. His Pho tai chin was a combination of Steak and Brisket with the delicious rice noodle soup, served with a side plate of fresh herbs to add as you please. 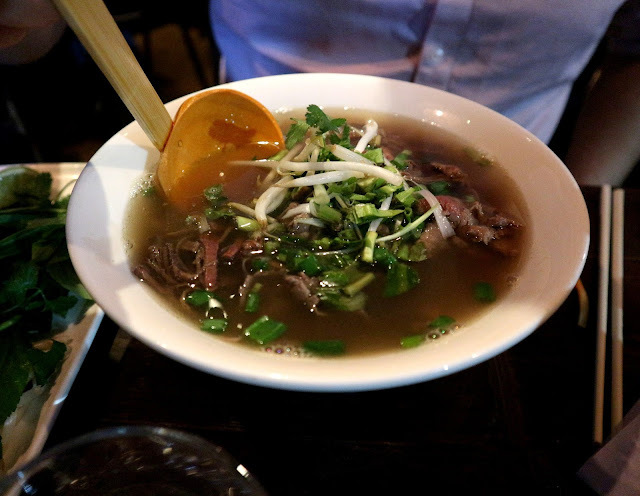 Adding herbs and table condiments is an essential part of eating pho and adds another dimension to the dish, Jordan said he enjoyed the comforting, delicious flavours of it from beginning to end. The stocks take around 12 hours to prepare - preparing the dish in this authentic way is key for the stock to retain all of its goodness and in developing their own distinctive tastes and aromas between the different dishes. It was packed full of flavour and definitely a dish for everyone to try out. I tried the Pho Xao, a delicious wok fried dish of flat rice noodles with lemongrass, chilli and Asian greens. Served with peanuts and nuoc cham. The dish had great flavours and I enjoyed using the nuoc cham as a nice sweet kick to the flavours. It definitely had more of a kick to it than I had expected it to so I would bare this in mind to what kind of spicy flavours you enjoy personally. I couldn't fit any more food in so we opted to share a pudding, satisfying our sweet tooth with the Banh so-co-la truffle. 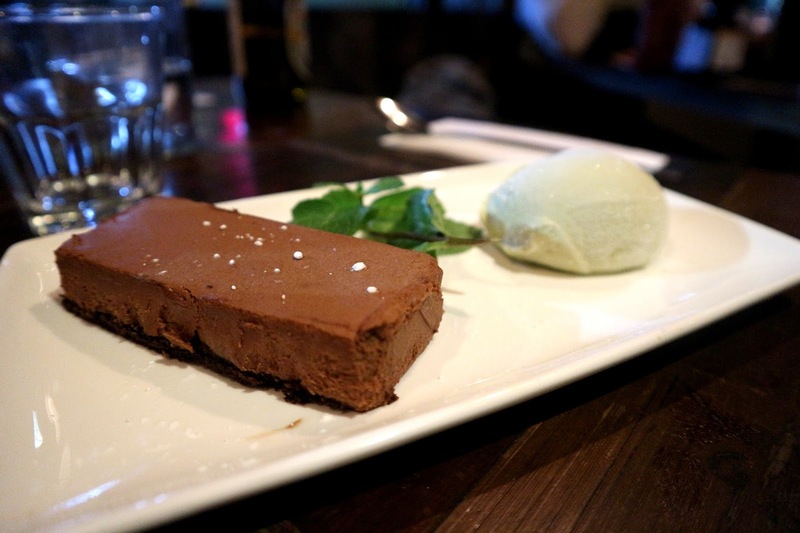 A Chocolate truffle slab served with green tea ice cream. This dessert was delicious and perfectly cleansed the palate after quite a kick from the starter and main course we experienced. I did decide to cleanse my palate with one of their fresh teas. The Fragrant Jasmine Flower Tea smelt so good and had such a comforting taste to it after feeling very full after dinner. I thoroughly enjoyed my dining experience at Pho and its definitely a restaurant that's on the list for a revisit, particularly for a date night before Christmas. The food is authentic, full of flavour and clearly has a passion for the culture and the country within it. The atmosphere is comfortable and there's a real buzz about the place, so definitely give it a try, even if you are like me and haven't sample Vinatemes food before. I can guarantee you'll be pleasantly surprised in it! Totally my type of place ! Lovely pictures and the food look so YUMMY !! !